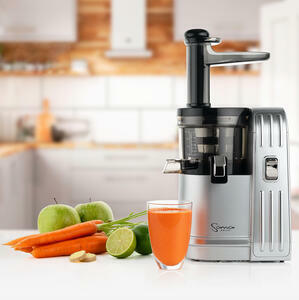 When customers ask us to recommend a juicer, we always ask what they wll be juicing. Generally a vertical juicer isn't our top recommendation if they plan to juice a lot of carrots. That's now changed. Sana, maker of the top selling Sana 707 horizontal juicer, just released their newest model: the Sana EUJ-828 vertical juicer. It uses the newest technology to make the best carrot juice we've ever tasted. 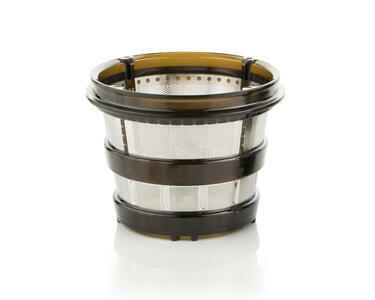 With a fine juicing screen for root vegetables, a coarse juicing screen for softer fruits, and even a solid homogenizing screen for making sorbet, it is a contender for the best vertical juicer on the market. Like most verticals, the Sana 828 performed well with fruits and berries. The coarse screen helps a lot in that area. But we were surprised how well it performed with carrots. We bought identical bags of carrots and tested them in several of our top-selling vertical juicers. 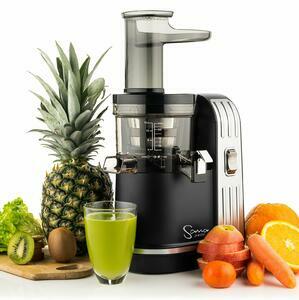 The Sana 828 had the lowest pulp content of any of the tested juicers, almost as clear as water. More significantly, the juice tasted sweeter than any of the others. We tried a blind taste test with several office members, to see if they could tell the difference between different glasses of juice. One glass was always the favorite - the Sana 828. How is it sweeter? We're not sure, but perhaps by removing almost all the pulp and skin, it has a higher content of just the sweet carrot juice. 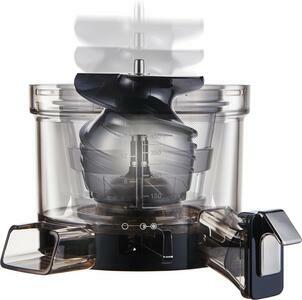 The Sana 828 has a redesigned juicing chamber and a smooth juicing screen without any places for pulp to get stuck. It makes cleaning the screen much simpler. Also, the pulp control lever allows you to release built up pulp at the end of juicing, leaving less to clean out. Among vertical juicers, the Sana 808 and Omega VSJ 843 have always been ranked as the top verticals when it comes to strained juice yield. A wide mouth vertical juicer will sometimes give a higher yield, but that is due to a higher level of pulp. After straining the juice, wide mouth juicers have lower yields. In our tests, we found that the Sana 828 matched the Sana 808 and Omega VSJ-843 in yield. Even better, it's new motor was quieter and less prone to jamming. The Sana 828 is too new to have any reliability information. Previous Sana products have demonstrated excellent reliability and we expect the new model to have the same stellar record. Like all Sana juicers, it is produced in South Korea where all the premium juicer brands originate. It is backed by Sana's impressive 10 year warranty for the motor and 5 years for parts, and lifetime service free of charge (customers pay only for the cost of parts and half of shipping after the warranty period is over).